The side streets of Whitby (called Snickleways in the city of York, term that means side street or alleyway that has since been adopted into official use) are narrow and confining yet many say that one does not walk them alone and pity be the one who discovers what walks with you in the dark on the misty nights on this small sea side English town. 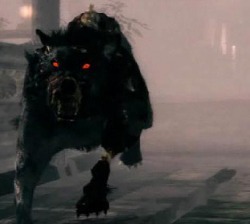 The streets of Whitby, York and the surrounding moors are haunted by the terrifying specter that takes a lupine form, huge and black, with gleaming red or green eyes that howls a deathly dirge and woe be to those that hear it because they are next to die. What is this monstrous apparition called? The barghest.